The Felixstowe hotels listed below are either in the town or we have given a rough guide as to how far they are from Felixstowe. We hope you enjoy your stay and find your ideal accommodation. Station: FELIXSTOWE. 0.2miles. Take the A14 toward Felixstowe. At the roundabout take the first exit onto A154 Candlet Road. At the next roundabout take the 1st exit A1021 Grove Road to the next roundabout - take the 4th exit to Beatrice Avenue. The hotel will be directly in front of you at the next roundabout. The Marlborough Hotel is the largest and only sea front hotel in Felixstowe, 250 yards south of the pier complex. The hotel has 49 en-suite bedrooms, many with sea views; a lift serves the 1st and 2nd floor. Close to the Port of Felixstowe and just 0.5 miles (0.8 km) from Felixstowe Railway Station, this family-run hotel offers free Wi-Fi, free parking and en suite accommodation. Close to the town centre and just metres from Felixstowe Railway Station, this impressive Victorian hotel is rich in original charm and traditional character, with free parking for guests. 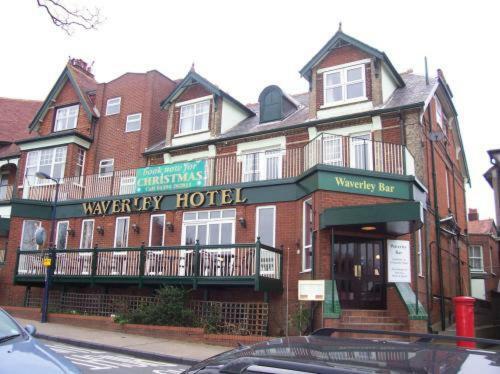 The Waverley is an Edwardian seafront hotel, situated within walking distance of Felixstowe's shops, bars and Spa Pavillion Theatre. The elegant hotel features a gastro-bar with a sea-view terrace. Felixstowe hotel. An elegant late Victorian hotel with 58 single, twin and double bedrooms and suites. Offering banqueting and conference facilities, dinner dances, short breaks, silver service restaurant, bistro style Buttery, two bars and more!